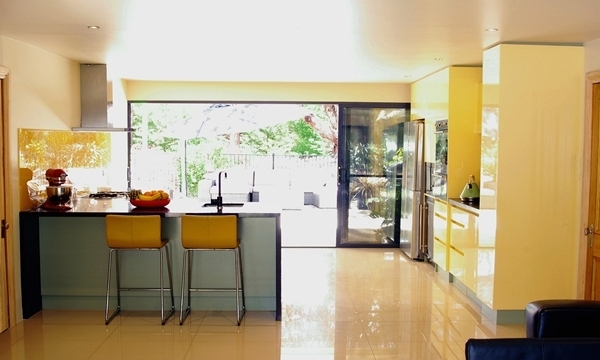 Kitchen Renovations in Adelaide | Contemporary Handleless. The plan was to open up this 1890s farmhouse kitchen and bring in more light. 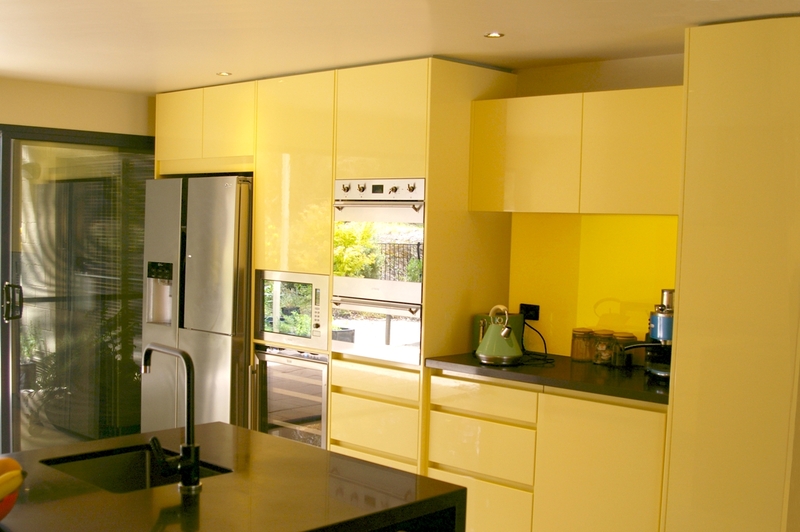 Adelaide couple Mike and Shirley decided to have a new kitchen built in 2016 after having replaced both end walls of their Kitchen / Dining / Family room with full width glass doors. The plan from the beginning was to open the 1890s farmhouse up and bring more light in. The kitchen dining room straddles the width of their house where replacing the small 19th century windows with sliding stacker doors created a free flowing inside outside space for their family living and entertainment. The farmhouse was purchased in 1989 where soon after Mike and Shirley renovated their Bathroom and then their Kitchen to better accommodate their young family. 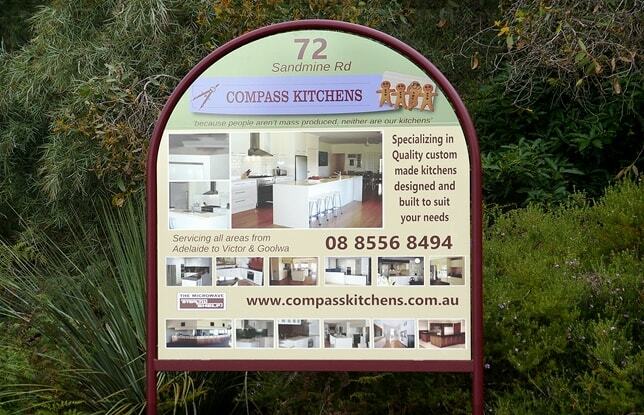 Compass Kitchens did this first Kitchen Renovation in the mid 90s which was done then, using a solid timber in a Colonial Style, where this served Mike and Shirley well for more than 25 years. As mouse and insect proof as possible. They first used their time to work through all the details of the design and tried out many different configurations until they were satisfied with the design’s look and functionality. 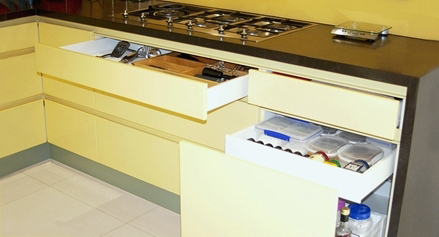 Shirley was adamant that there were to be no high cupboards over the main work surfaces; “I don’t want anything to interrupt the views outside and I want the kitchen to blend in with this and not to stand out.” The main workbench includes a much used breakfast bar with Waterfall Ends, even the kitchen sink tap was thought through and they selected a black Finish so to blend into the benchtop and reduce its visual impact. 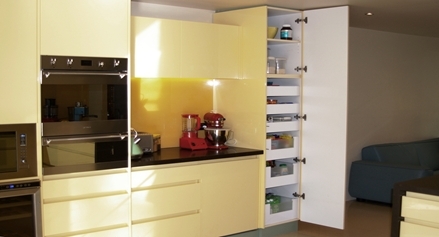 For the technology used for example, we used modern Blum fittings throughout and for the 2 high cupboards these doors are motorized for ease of access. 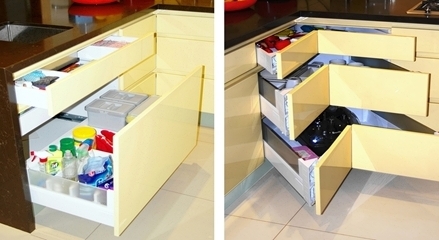 The drawers throughout are all full extension with soft close. The use of the Caesarstone Emperadoro a dark chocolate colour with lighter marbling flecks gives a warm contrasting statement and is combined with a two pack British Paints colour Honey Oat and Harmoniously accented with the British Paints colour Mossy Road for kickboards, Bar back panel and the ceiling shadow line. The combination reflects the views from outside while creating a warm inviting space within. At night with the down lights on, the space has a very smooth warm inviting feel. Of course a bespoke beautiful kitchen must have the right appliances so a Smeg 60 cm double catalytic oven, a Smeg 90cm low profile cooktop and a built-in Smeg 25L convention microwave were selected. 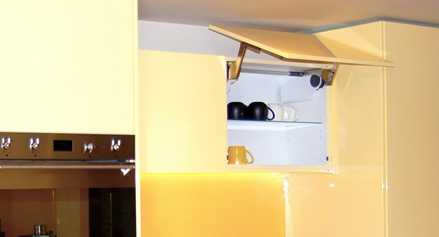 Mike and Shirley chose a Sirius 90cm canopy range hood here because we could install the extraction fan and motor into the roof space making it quite to operate; even on the high settings. 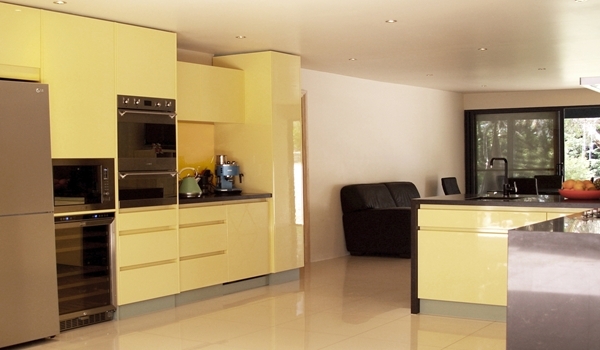 They selected a Fully Integrated Bosch dishwasher where we continued the line of the recessed handles, along with an LG side by side fridge freezer and a Delongi 42 bottle wine fridge to complete this kitchen’s well appointed appliances. Both Mike and Shirley thoroughly enjoy cooking and gourmet meals are the norm at dinner-time. 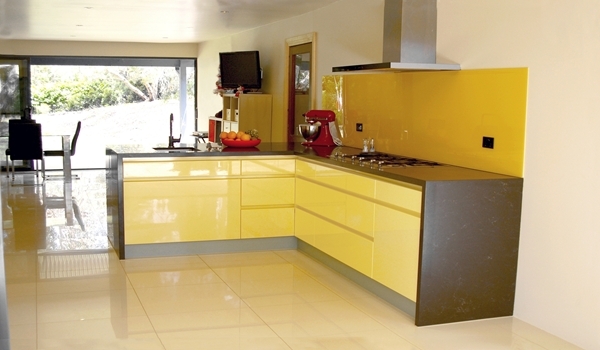 They have decided to call this kitchen style what it is; being their “Modern Aussie Country Kitchen with a nod to Art Deco” with it bringing this lovely old Country farmhouse forward in time from the 1890’s and into the modern comforts of the 21st century.